WASHINGTON (CN) – An Air France jet passed over the landing site of an intercontinental ballistic missile North Korea fired last week just 10 minutes before the missile landed, according to a report by ABC News. “Moreover, in cooperating with the authorities, Air France constantly analyzes potentially dangerous flyover zones and adapts its flight plans accordingly,” the statement reads. Amid the ongoing tensions over North Korea’s latest missile launch, the U.S. Air Force on Wednesday successfully launched an unarmed intercontinental ballistic missile from California, the fourth such test this year. The news of the relatively close call with the airliner comes at a time of increased focus on North Korea from the administration and members of Congress. Sen. Lindsey Graham, a South Carolina Republican who sits on the Armed Services Committee, said on the “Today” show on Tuesday that military action against the reclusive state is “inevitable if North Korea continues” pursing its missile program. “There is a military option to destroy North Korea’s program and North Korea itself,” Graham said. President Donald Trump earlier this week promised to “handle North Korea,” while Secretary of State Rex Tillerson in a press briefing on Tuesday said the United States is not seeking to replace the North Korean regime. In a statement to Courthouse News, a State Department representative reiterated the department’s concerns over the test and others like it. “As we have said before, reckless missile launches by North Korea threaten civil aviation and maritime commerce in the region,” the representative said. 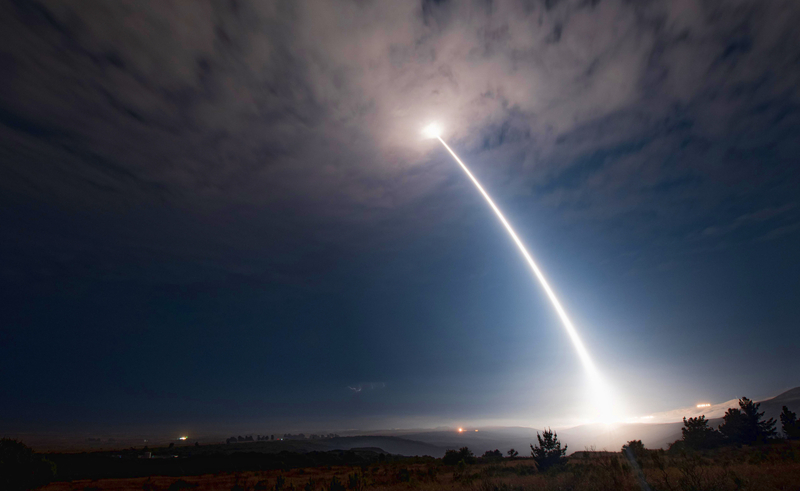 The 30th Space Wing says the Minuteman 3 missile launched at 2:10 a.m. Wednesday from Vandenberg Air Force Base, about 130 miles (209 kilometers) northwest of Los Angeles. An Air Force statement said the test would show the effectiveness, readiness, and accuracy of the weapon system. Minuteman missiles are regularly tested with launches from Vandenberg that send unarmed re-entry vehicles 4,200 miles (6,800 kilometers) across the Pacific to a target area at Kwajalein Atoll.